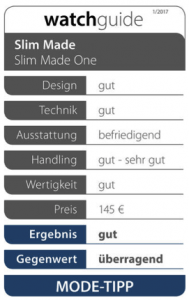 WATCHGUIDE tested SLIM MADE one – value „outstanding“! A big thank you to René Roland Katterwe from WATCHGUIDE for this amazing review and of course also for the result “good” with an “outstanding” value equivalent! and in the end it even received the label “fashion-tip”. That in deed makes of very proud! But of course this applies to all our ultra flat wristwaches! 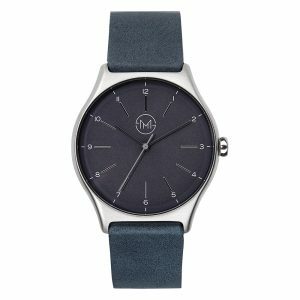 “Around 150 EURO is a very reasonable price for a watch. Why? Because it would be unreasonable to go into dept for an every day watch, as the mobile phone is already eating up most of your people’s the time budget, wait, the available financial budget I mean of course. 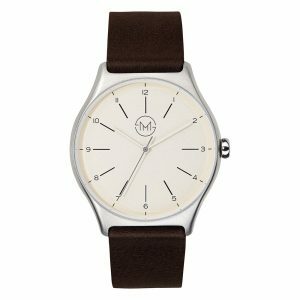 This allows basically everyone to own a very special designer watch. And just as a side effect you save a lot of time reading the time on the watch and not having to pull out the model each time – there are actually supposed to be some people that don’t always hold their phone in their hand. To sum it up, guys: Your watch if now officially OUTSTANDING!! !